Midfielder Will Vaulks applauds the Falkirk faithful at the end of Tuesday night's Betfred Cup clash with Elgin City. Speculation continued to rage around the future of Falkirk midfielder Will Vaulks after he appeared to bid Bairns fans farewell on Tuesday night. The 22-year-old Englishman returned to Peter Houston’s side for the Betfred Cup visit of Elgin City after missing last Saturday’s defeat at Stirling Albion. The midfielder has been linked with moves to a number of English clubs with Barnsley and Rotherham United reportedly at the head of the queue and Bristol City also thought to be in the running. Vaulks’s omission from the line-up at Forthbank prompted suggestions that he had played his last game for the club and that he had been left out with a ‘diplomatic injury’ pending his imminent departure. However he returned to his accustomed place at the heart of the Bairns midfield on Tuesday and his return coincided with a much improved performance. 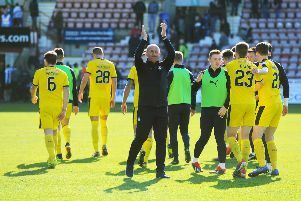 An opening goal - and a trademark somersault celebration - paved the way for a 3-0 win which revived Falkirk’s hopes of making the knockout stages of the revamped League Cup. Vaulks pulled the strings in the centre of the park - and after the match Houston insisted the club had not received an acceptable offer for the midfielder. However he admitted that he would not stand in the player’s way of a lucrative move down south if the right offer does come in. He said: “There’s nothing concrete. If there’s interest in Will and somebody puts an offer on the table and he’s in his last year, if that offer is accepted by the Falkirk board, I certainly wouldn’t stand in Will’s way. Houston continued: “I will never hold a young player back to try to better himself.